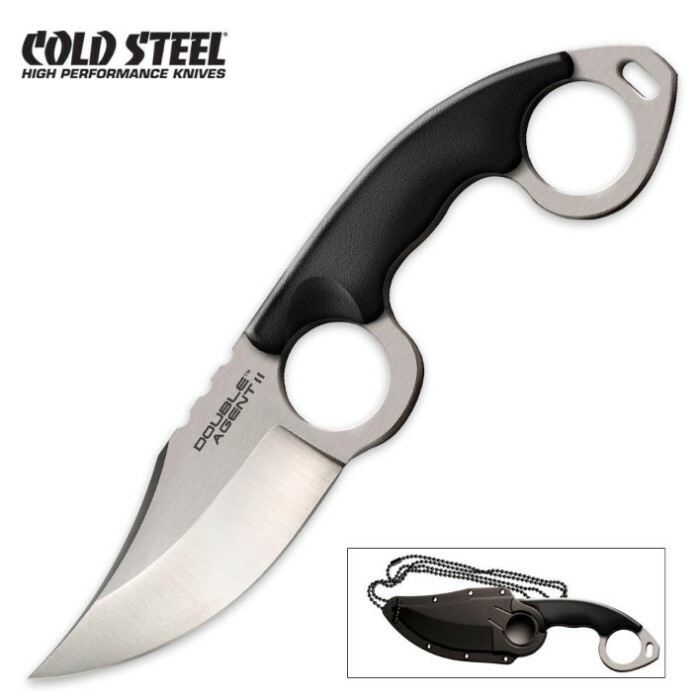 Cold Steel"s new Double Agent neck knife possesses a significant set of advantages worth noting. Designed by Zach Whitson, this thin, flat, and super light knife makes it easy to conceal and very comfortable to wear. The most audacious and notable feature, however, is its double ring handle design. Slip an index finger through the front ring nearest the blade and your pinky finger through the rear ring and close your fist to obtain a forward grip and vice versa for a reverse grip. It doesn't matter how hard you cut, chop, hack, hammer or thrust with the Double Agent. Its twin rings will always prevent your hand from sliding forward on the razor sharp edge and will likewise resist the effects of centrifugal force or the efforts of an adversary to wrest the Double Agent from your grasp. 3" blade, 7 7/8" overall. razor sharp out of the box, but goes away fast because its almost inevitable to rub the edge on the sheathe when putting it away. At first, its hard to get used to, but with practice pulling it out and putting it away becomes second nature. Feels great in your hand thanks to all the control from the two finger holes and the light weight of the blade. buy it. I bought this knife a couple of weeks ago as a pair with the Double Agent I neck knife. I have to say, I am impressed. Shipping was fast and delivery went smoothly, and when I picked up this knife I was completely thrilled to find that I got exactly what is in the picture. The knife is beautiful, the edge is sharp and the grip is perfect. The hold on this knife is very secure, and it is so light that it almost feels like I'm carrying nothing at all. Don't let that fool you though, it is also easy to tell that this knife is quite sturdy and dependable. I am completely pleased, I got exactly what I was hoping for at a great price. I will definitely be a repeat customer.